06/05/13 - Rydell Industrial (Belting) Co has been a stockist/distributor for the comprehensive range of Gates Industrial belts for over 30 years. 31/10/12 - Rydell Industrial (Belting) Co, a major distributor for the comprehensive range of Gates industrial belts offers Gates agricultural belts with the assurance of reliability even under tough conditions. 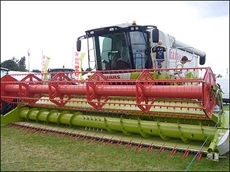 14/07/11 - Specialist belt supplier, Rydell Industrial (Belting) Co are now able to supply the comprehensive full range of Gates agricultural belts.